Hi Stampers! Welcome to day 3 of my Button Buddies class samples. It was a busy weekend so I didn't get as much accomplished in the way of setting up blog posts. Hopefully, I will have some time this week because I want to post some sneak peeks at the upcoming Chock-Full of Cheer class! If you are in the Central NJ area and are interested in taking this class, email me at sarah@sarahsstamplab.com. And now on to the card! I went for a very simple layout on this one because we are using three pretty big buttons on it. I'm not sure it this one can be mailed with a regular postage stamp. You may have to put a $0.65 stamp on it. Or just visit the person and hand it directly to them! Here are the other days of the Button Buddies class, in case you missed them! Don't forget about the Back to Spool promotion! Click here for more details! 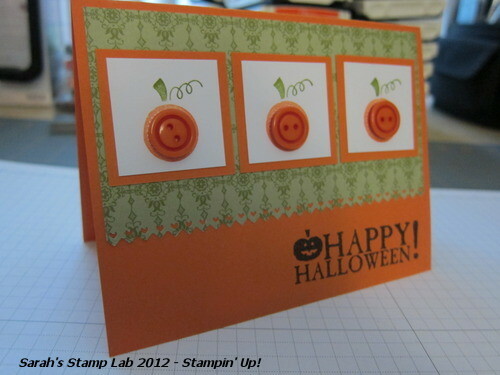 I love your Halloween card, Sarah! Those little button pumpkins are just adorable and I love the colours and papers. Very nice!